DISCLAIMER: Daniel H. Erskine expressly disclaims any and all responsibility and liability with respect to actions or omissions based on any information or articles contained in this Site. THIS SITE AND ITS CONTENTS ARE PROVIDED "AS IS." DANIEL H. ERSKINE DISCLAIMS ANY REPRESENTATION OR WARRANTY OF ANY KIND REGARDING THIS SITE, ANY OTHER SITE TO WHICH THIS SITE PROVIDES CLICK-THRU ACCESS, INCLUDING THIRD PARTY SITES, OR THEIR RESPECTIVE CONTENTS. WITHOUT LIMITING THE GENERALITY OF THE FOREGOING, DANIEL H. ERSKINE DISCLAIMS ANY IMPLIED REPRESENTATION OR WARRANTY OF TITLE, NON-INFRINGEMENT, MERCHANTABILITY, ACCURACY, COMPLETENESS, OR FITNESS FOR A PARTICULAR PURPOSE REGARDING THIS SITE, ANY SITE TO WHICH THIS SITE PROVIDES CLICK-THRU ACCESS, INCLUDING THIRD PARTY SITES, OR ANY OF THEIR RESPECTIVE CONTENTS. SOME STATES DO NOT ALLOW THE EXCLUSION OF IMPLIED WARRANTIES SO THE FOREGOING DISCLAIMER MAY NOT APPLY TO YOU. Portions of this Site may provide hyperlinks, framing or other "click-thru" access to sites owned and operated by persons other than Daniel H. Erskine. ("Third Party Sites"). The availability of click-thru access to Third Party Sites is not intended to create or imply any affiliation between Daniel H. Erskine and the owners or operators of any Third Party Site, or any sponsorship by Daniel H. Erskine. of any Third Party Site or its owners or operators. You acknowledge that these Terms and Conditions contain no representation, warranty, or endorsement by Daniel H. Erskine. of any Third Party Site or any of the products, services, information, or other content available on that site. Your use of any Third Party Site will be governed by the terms and conditions posted on that site. Your rights and obligations with respect to any of the products, services, information, or other content of that site will be determined by those terms and conditions. You acknowledge and agree that your use of any information, material, products and services offered by any Third Party Site is solely at your own risk. (A) YOU SHOULD NOT CONSIDER THIS SITE TO BE AN INVITATION TO ESTABLISH AN ATTORNEY-CLIENT RELATIONSHIP. 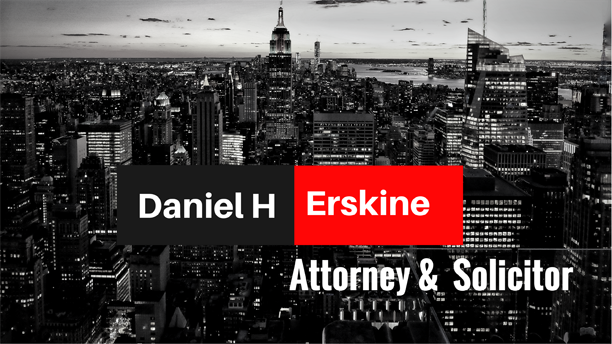 YOU AGREE THAT DANIEL H. ERSKINE IS NOT ENGAGED IN RENDERING LEGAL SERVICES OR ADVICE BY PROVIDING THE INFORMATION, MATERIALS, AND CONTENT ON THIS SITE, AND THAT YOUR USE OF THE SITE DOES NOT CREATE ANY ATTORNEY-CLIENT RELATIONSHIP BETWEEN YOU AND DANIEL H. ERSKINE DANIEL H. ERSKINE ASSUMES NO RESPONSIBILITY FOR ANY CONSEQUENCE RELATING DIRECTLY OR INDIRECTLY TO ANY ACTION OR INACTION YOU TAKE BASED ON THE INFORMATION, MATERIAL, OR CONTENT ON THIS SITE.